Clifton Hall was built in 1897 but the assembly began several years before this. 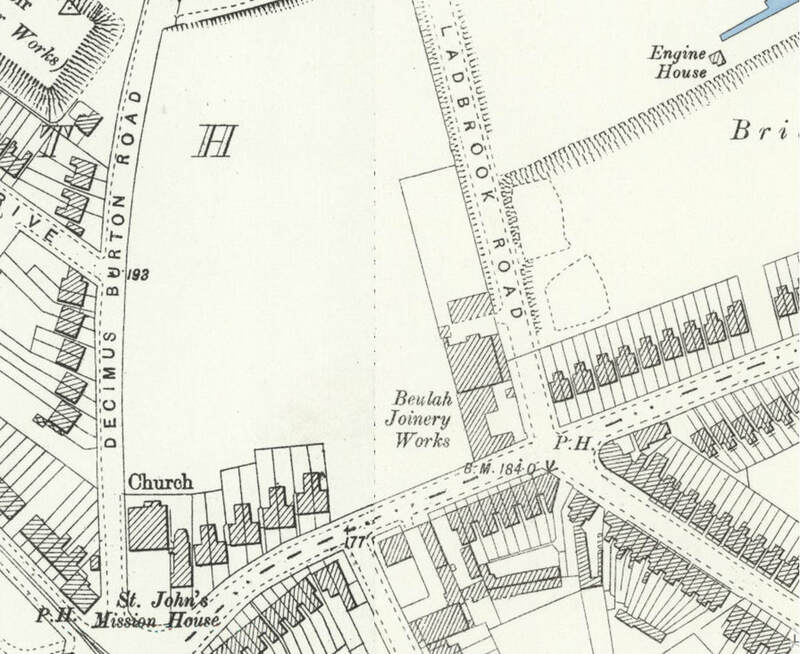 Details are sketchy but it is known that the Christians met in a place called the "Iron Hall" on Holmesdale Road near the railway station. This was probably a "tin tabernacle" which were common in those days. It is possible that they were originally associated with Christians who began a work amongst children near Norwood Junction railway station. This work grew and an assembly was formed. They first met in South Norwood High Street above a coffee shop. 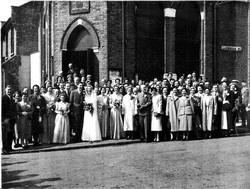 Numbers increased and eventually Denmark hall was built in Denmark Road, South Norwood to accommodate the new church. The assembly was founded by a wealthy believer named Mr Kingsbury who purchased a joinery and the adjacent house and built Clifton Hall in 1897. Some thirty years later in 1929 the assembly formed a trust and bought the two properties from Mr Kingsbury. The adjacent house was used for Sunday school work and numbers were so great in the early part of the 20th century that several class rooms were hired in the local school nearby, Whitehorse Manor School, to meet the need. Numbers in fellowship was around 220 plus in the 1920s but decreased after World War 2 to nearer 120. A magazine, Clifton News, was launched in 1948 with a group of seven believers responsible for the production to inform the assembly of all the activities going on and stimulate interest and prayer. Young people's work flourished with Pioneers in the 1950s and Jucos and Covenanter groups in the 1960s & 70s. There were annual tournaments where sports and matches were played against other Juco and Covenanter groups from around the country. From the British Newspaper archives, we have dug up some stories from the past. Two conscientious objectors attending the Plymouth Brethren meetings in South Norwood came before Croydon Military Tribunal on Thursday night. The first applicant, a stockbroker's clerk, refused to take part in the war, either as combatant or non-combatant. Mr. Kingsbury. the missioner of Clifton Hall. who supported the claim, said that he well the founder of the meeting at South Norwood. and could vouch fur applicant's genuine convictions. The other applicant, young insurance agent had attended the meetings at Clifton for several years. He was not prepared to take any part in the war. A Brethren leader, who accompanied him, said that warfare had often been discussed before the war by applicant and other Brothers, and it had always been understood that the Brethren should take no part in any military activity. Both applicants were offered and accepted work of national importance. Cynthia Cooper who was in Clifton Hall sent us the following information for which we are very thankful. I can recall some memories and have some photographs and Baptismal certificates and some hand written notes my father in law recorded of the Clifton Hall Bible School held in 1946 and 1947 and 1948. My husband was awarded a New Testament by the Scripture Gift Mission for answering questions on each of the chapters of the New Testament in 1951,Phew ! I still have it. A little about me, I grew up in Carshalton and attended West Street Hall Sunday school with my brother and sister, at age 11ish I heard about Jesus coming again ,I was perplexed and had a dream about this and the following Sunday I asked my teacher, Miss Moss about it, I recall her praying with me. 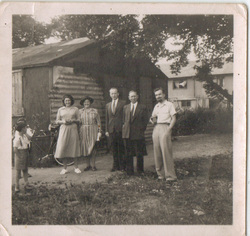 In early 50’s my family moved to New Addington. I believe the Elders contacted a Mr Kent from Sanderstead and we were invited to attend a Sunday school which was being held in Fairchilds School New Addington. 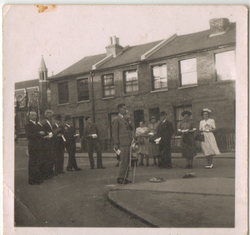 This would appear to be joint effort from other Brethren assemblies as by this time my Father in law and family also moved to Addington and Mr Cooper became my Bible class leader. 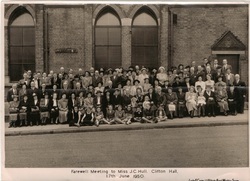 I seem to have attended other youth gatherings at Addiscombe Hall and Clifton Hall, I was baptized in Clifton Hall on 8th July 1956.By this time I had started a cadet nurse training at Sydenham Children’s Hospital. My husband was baptised by Mr C.J Atkins at Clifton Hall on 28th April 1957 , his mother ,Mrs Ethel Emily Cooper was baptised on the 19th June 1935 by Mr W.E.Rose. I have certificates for Francis and Ethel but can’t find mine at this point in time but a devotional book, God Calling from my parents records the date I recently learned it is still printed ! I have fond memories of youth meetings at Clifton Hall ,Tony and Kathleen Horne showed us generous love and fun ,their home was packed with young people and always an abundance of food ! 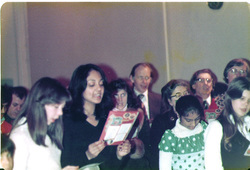 I have a photograph of the choir ,26 of us including Tony Horne. Faces look familiar but wish I could remember names.!!! If My husband was still with us he would have been good at remembering some of them, his sister Valerie is in the group but has poor memory loss now so cannot ask her. It was good to see the wedding of the Mackays on your web site we kept in touch with them for many years. My mother in law still had sisters living in Dagnall Park and they attended Clifton Hall, their names were, Hilda Phyllis and Nellie Fletcher. My sister in law Valerie was married at Clifton Hall to Sydney Walker about 1957,however Francis I were married at Addiscombe Hall on 16th January 1960. I also remember seeing at Clifton hall ‘Through Gates of Splender’ the story of Bill and Elisabeth Elliott and pioneer work to the Alka Indians . I recall the open air meetings too. It’s not only how you start the race but how you finish and I have been blessed with good Bible teaching over many years and many blessings of friends with me on the journey, Christian Union at school, Nurses Christian Fellowship, Rochester Brethren Assembly, Wantage Baptist Church and since 1998 visits many times to Ukraine, initially soon after Ukraine got their independence to help on youth and children’s camps, anniversary celebrations ,weddings and some just personal visits to life long friends. That’s all another story too long to recall here but they have enriched my life but if you would like to know more I can fill you in another time. My three boys and four grandsons are blessing my life and I am thankful for them. Blessings to all the faithful ones at Clifton Hall, sincerely yours, Cynthia Cooper. If you have had any links with Clifton Hall in the past and can help us with insights into its past history particularly before the 1970s, we will be pleased to hear from you. A children's outreach was conducted at Pollards Hill, Norbury.